Site: New York Giants Headquarters, East Rutherford, N.J.
What I Saw: Evening practice, Thursday, Aug. 20. 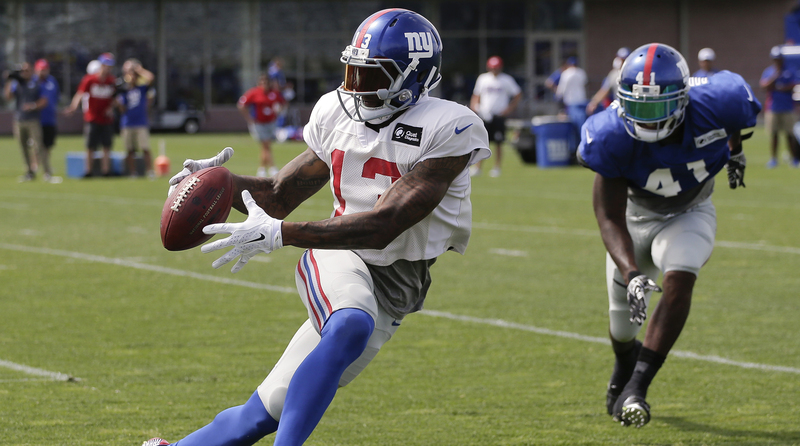 Giants were mostly working off cards to prepare for their second preseason game. 1. Jason Pierre-Paul is still missing from Giants camp, and the Giants are still largely in the dark about just how bad the star defensive end’s injuries are after his July 4 fireworks accident. Steve Spagnuolo helped make his reputation as a defensive coordinator by playing combinatorics on the defensive line, and for now, he’s doing it without his best chess piece. The other players on the board: Cullen Jenkins, Johnathan Hankins, Robert Ayers, Jr., Kerry Wynn and former third-round pick Damontre Moore, whom the Giants are still trying to get more consistent play from. 2. Eli Manning is one of the last players in the NFL who would let lingering contract negotiations affect his play on the field. That doesn’t mean he and his agent would be willing to accept less than market price (and market price, as it turns out, would likely end up making him the highest paid player in the NFL). Semantics aside, there are always disagreements in contract negotiations until, well, an agreement is reached. But the way we know Manning is wired, he will play the same regardless of what’s going on at the negotiating table. 3. The offensive line is still a work in progress in pretty much every sense of the word. The opening-day lineup isn’t even set. Right now, they’re working with rookie LT Ereck Flowers, LG Justin Pugh, C Weston Richburg, RG John Jerry and RT Marshall Newhouse, while Geoff Schwartz is still working his way back from a season-ending left leg injury. The Giants have a very deep group of offensive playmakers, but in order to get the ball to those playmakers, the line has to play with some measure of consistency. What will determine success or failure for the Giants: It’s the same story of the last few years—will they be able to win in the trenches? Despite efforts to upgrade in the draft and free agency over the past few seasons, the offensive and defensive lines are still two huge question marks for the team right now. Player I saw and really liked: I watched a cards practice, so it’s hard to make too many assessments from that, but is it any surprise that it’s impossible to take your eyes off Odell Beckham, Jr., on the practice field? Beckham caught a crossing route and sliced and diced his way through the defense for what would have been an 85-yard touchdown. The electricity he brings to the field is tangible. Five dot-dot-dot observations about the Giants: WR Victor Cruz insisted that his strained calf muscle, on the opposite leg as the patellar tendon tear that ended his 2014 season, is a minor injury that will not sideline him for an extended period of time. He was running around before practice, a good sign. … Injured left tackle Will Beatty, who is sidelined with a pectoral tear, still attends almost every practice, supporting his teammates from the sideline. … The Giants were lucky in that second-round pick Landon Collins suffered only an MCL sprain, rather than a more significant knee injury in the first preseason game. He’ll be out more than a week, but was already taking walk-through reps on Thursday night. … The fact that the first three observations were all related to injuries underscores the fact that, despite tracking players’ workloads and moving around practice times, the Giants still have not kicked the injury bug that has plagued them the past few years. … I get a kick out of the fact that Tom Coughlin is now calling the different sections of practice not “periods” or something like that, but rather, “mods.” Great word. The one name on the roster I’d forgotten about: Most of the NFL had forgotten about Brandon Meriweather, the oft-suspended safety who was last with Washington in 2014. Desperate for help at the safety position, after Mykkele Thompson was lost for the season with an Achilles tear and Nat Behre (calf) and Landon Collins (knee) picked up short-term injuries, the Giants signed Meriweather off the street. He’s been working with the second-team defense, trying to get up to speed. The thing I’ll remember about East Rutherford, N.J.: The detail with which Justin Pugh described the dental work that sidelined him for a practice earlier in the week. “I fractured my back molar,” Pugh began. “It was a long process trying to figure out how to fix it.” In earnest, Pugh then described that long process. “It got infected. It was no good. I did it probably six months ago. They kept telling me I was grinding my teeth. I had to wear a night guard. It was ridiculous. Then they find found out once it got infected that there was probably something wrong with it more than just grinding my teeth. I had to go to an oral surgeon to get the image they needed to finally see. So they took the tooth out, put a bone graft in and all this stuff. I didn’t know you could do all that.” Pugh is an affable guy generally, but the Giants offensive line has taken a lot of heat this summer, so here’s guessing he wanted to make clear that he wouldn’t miss a practice for just any old dental work. Message received. Gut feeling as I left camp: The skill position talent on offense is impressive enough to believe the Giants are capable of putting up enough points to be competitive against any team. Of course, there’s always one big if with this team—if they can stay healthy.